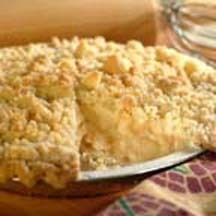 This pie is a simple to make tasty treat thanks to the convenience of frozen escalloped apples and ready-to-use, refrigerated pie crust. Thaw escalloped apples in the microwave at MEDIUM (50% power) 5 to 6 minutes; set aside. Combine butter, brown sugar, and flour in a small bowl, stirring until blended. Stir in walnuts. Cover and chill. Roll pie crust into a 15-inch circle. Fit into a well-greased 10-inch ovenproof skillet, allowing dough to hang over edges of skillet. Spoon apple mixture into shell; fold pastry over filling, leaving center of pie uncovered. Brush pastry with milk. Sprinkle butter mixture over top. Bake in a preheated oven at 400°F (205°C) for 40 to 45 minutes or until browned. Serve pie warm.